One of the best things about going on the Shop Hop was meeting the wonderful people who were working and fellow shoppers. 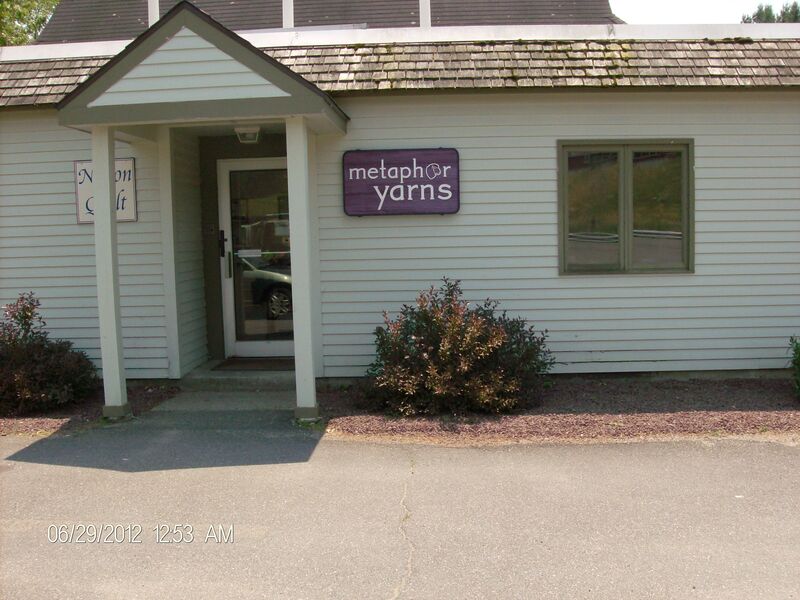 At Metaphor Yarns in Shelburne Falls, Ma we were shown how to weave our ends in as we knitted a two color hat. I had restricted my two color projects to crocheting for many years because I just didn’t like the carry yarns on the inside of my knitted projects. With some practice I should be able to work through the three free patterns we were given – a hat, mittens, and fingerless mitts – and finally be able to knit multi-color items. I’m very excited about this as I’ve had fingerless mitts in mind for my studio for quite some time. This delightful woman, and I’m truly ashamed of myself for not asking her name – I’m afraid I was much like a small child in a candy shop that day – had 2 hats started so that we could be certain that we understood the process before we left. I think I could have stayed in that shop for quite some time if we hadn’t been on a schedule. 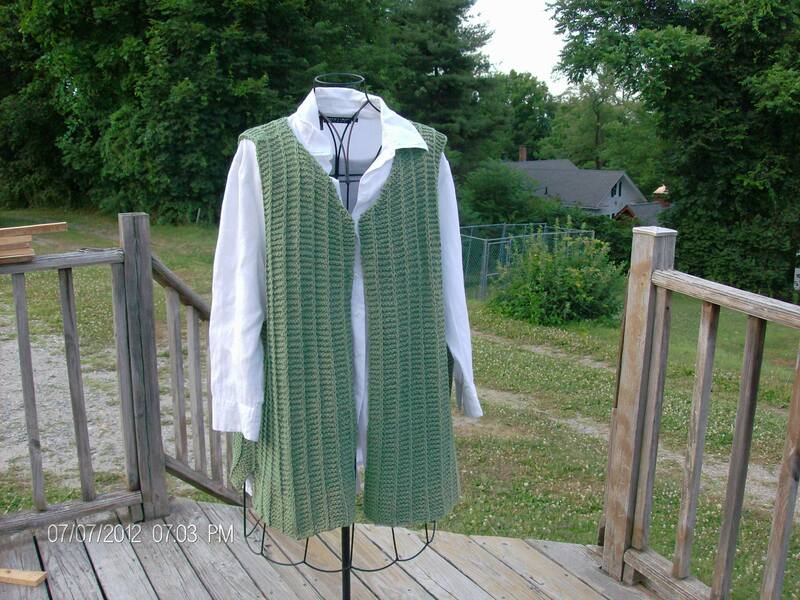 Last night I managed to finish the cotton vest I’ve been knitting, and unknitting, for a couple of weeks now. I think that my incentive was to finish it so I could put one of the cool buttons I bought at Green Mountain Spinnery on it. 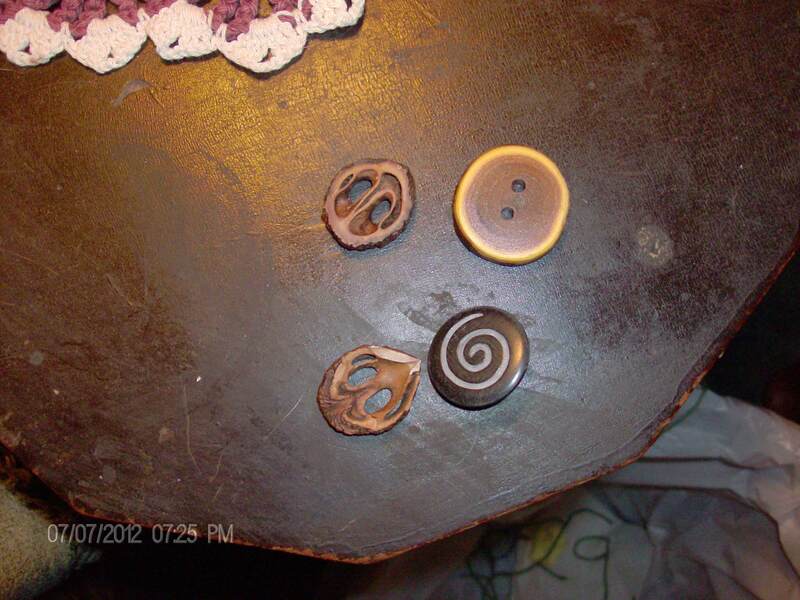 I actually did have the vest in mind when I bought the large wooden button, but the others are for projects not yet chosen. We will see how that goes. Now if I can only find my sewing needles and thread I’ll be all set. It shows just how often I sew that it has vanished into the “safe place” in our home. Personally I convinced that the safe place is a 10′ x 10′ room without a door and all of my missing, or things I put away so that I could easily find them, are residing there. I could swear I brought my little sewing kit downstairs because that is where I do most of my repairs and creative things, but though I’ve searched and searched it still hasn’t shown up. Do you have a place like this in your home? Thank you. I think I’m going to buy one of those cute little kits tomorrow so that I can sew it on.